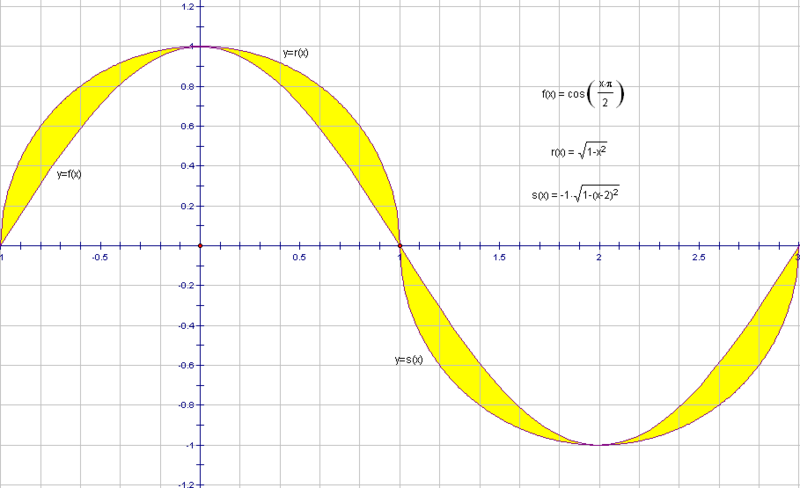 The inner boundary of the yellow regions above is a sine curve (technically, a cosine curve, but that’s the same thing, just with a phase shift). The outer boundaries are semicircles. In order for this to work, to form these yellow regions, the semicircle centers (centers of the circles they are each half of) must be directly below peaks, and above troughs, of the sine (or cosine) curve, and vertically positioned at what would be called the rest position in physics. (I’m resorting to use of some physics terminology here, simply because I don’t know the corresponding mathematical terms). In addition, each semicircle involved must have a radius equal to one-fourth the wavelength of the sine or cosine wave. The two sets of curves cross each other at the rest position, and are tangent to each other at each peak and trough, producing four of these yellow regions per wavelength. In this case, semicircles could used because I adjusted the wavelength, making it exactly four times the amplitude of the wave. My goal was to compare the two curves, simply to see how well one simulates the other (answer: not very well at all). Then, however, I became more interested in the discrepancy between the two, represented by the yellow regions which are outside the true wave, and inside the semicircles which contain that wave. Until and unless I find that such regions already have a different name, I am naming these two-dimensional curved shapes “circumsinusoidal regions.” There are four of them per wavelength of the wave, and two per semicircle. Each circumsinusoidal region has two vertices, but the two paths connecting them are distinct curves. No part of either path contains any length which is a straight segment. It would be possible to generate interesting solids by rotating circumsinusoidal regions around vertical or horizontal lines, such as the x- or y-axes, or around diagonal lines. Many such solids would be variations of a torus, including the central hole of a torus, but with circumsinusoidal cross-sections replacing a torus’s circular cross-sections. Unfortunately, I do not have the software I would need to generate pictures of such solid figures. If the wavelength used for a given sinusoidal wave is not exactly four times the wave’s amplitude, semicircles won’t work to enclose the wave with the same points of tangency, but it is still possible to generate circumsinusoidal regions — using something, in their place, other than semicircles. This will be described in part two, which will be the next post on this blog. This entry was posted in Mathematics and tagged area, circle, circumsinusoidal, cosine, curve, curved, function, geometry, Mathematics, region, semicircle, sine, trigonometry, wave by RobertLovesPi. Bookmark the permalink.